Eva Trends sweater dress with a helping of mustard & Link Up | Is This Mutton? When the weather gets colder, this warm, snuggly dress from Eva Trends will be ideal. 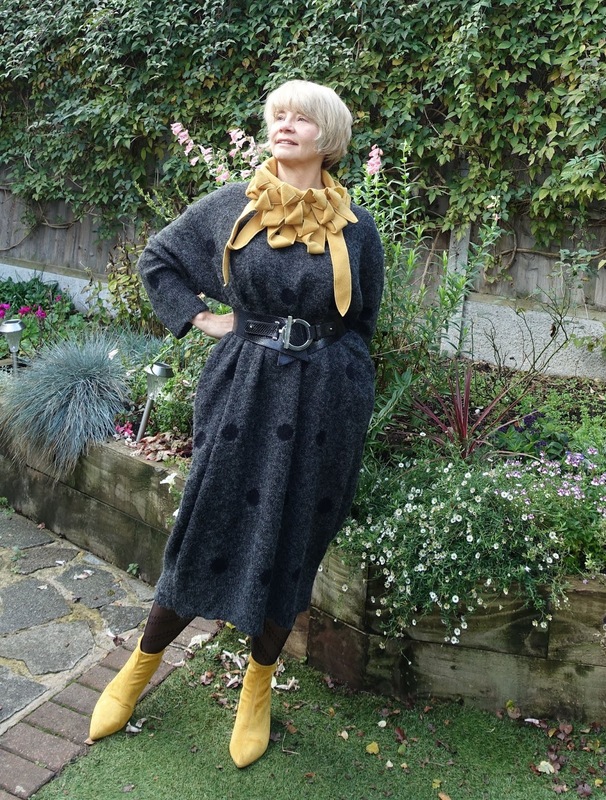 It's a one size dress in wool and mohair, featuring large polka dots and pockets. 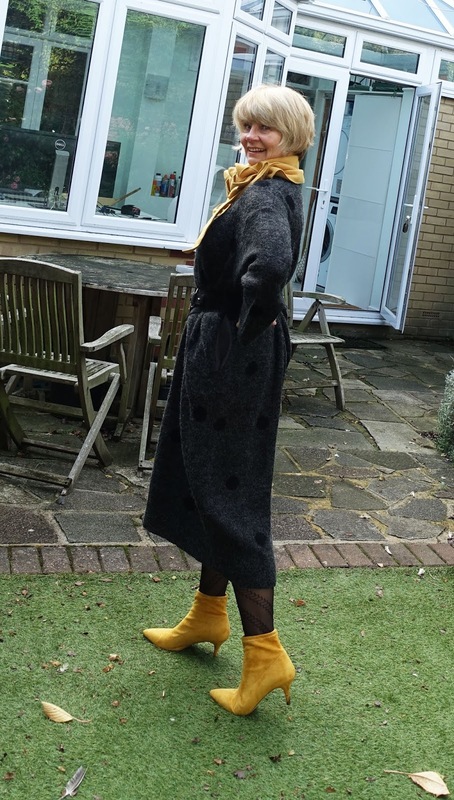 I added a helping of mustard with my pull-on sock ankle boots from Sainsbury's, last seen here, and new in at Rew, the Ellie gold collar. 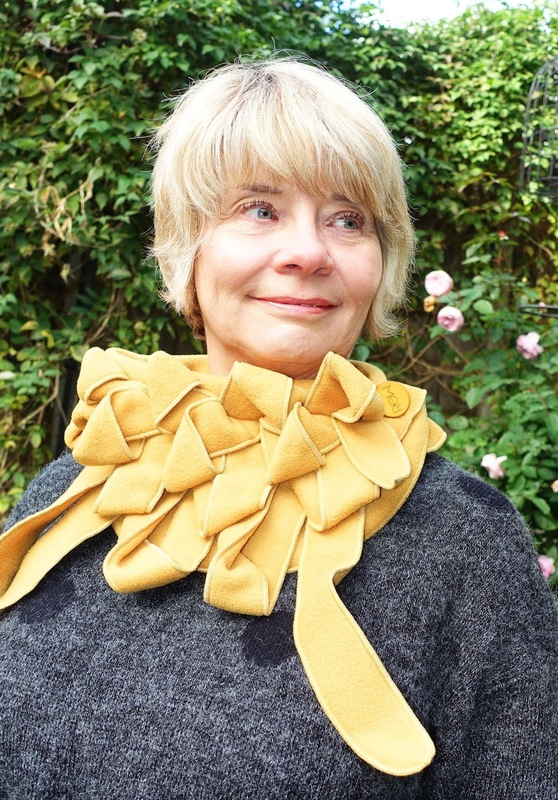 If you're a regular visitor you'll know I love these collars scarves from Rew. You fasten them with one button, simple! This one is made of fleece, so another warm item for winter. Eva Trends is offering Is This Mutton? readers a 10% discount across its entire website. Use code GH10. You can find the Bulge Polka Sweater Dress dress here (somewhat unfortunate name!). Grey is sold out but black is still available. Sharing this post with #WeekendBlogHop at Claire Justine, On Mondays we Link Up with Glass of Glam; #Anything Goes at My Random Musings, #ShoeandTell at Style Nudge; #IwillwearwhatIlike at Not Dressed as Lamb, Visible Monday at Not Dead Yet Style; Style with a Smile at Stylesplash; Turning Heads Tuesday at Elegantly Dressed and Stylish, #SpreadTheKindness at Shelbee on the Edge, Chic&Stylish at Mummabstylish, Top of the World Style at High Latitude Style, Fabulous Friday at A Pocketful of Polka Dots, #Weekend Wear at Threads for Thomas and Thursday Moda.at Elegance and Mommyhood. Today (Weds Nov 7)) is my birthday, although we'll be celebrating it on Friday with a trip to the theatre and dinner. It would make my day if you could join the #WowOnWednesday link up! Last week's readers' favourite was Maria from Passion Fruit, Paws and Peonies. She wowed with her dressy blouses to wear with jeans. 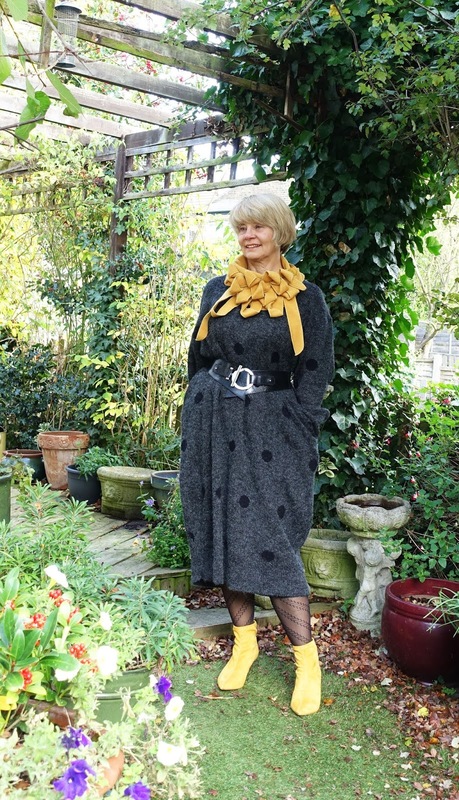 Superb styling Gail. Mustard and grey never fails. Have a fabulous birthday . After being away from full time blogging for a while Ive come back to all these amazing new faces. Yours included. I'll have to keep your party in mind - thanks for being a fabby host. I love your scarf and booties - elevates that fabulous dress to new levels. Have a great week.